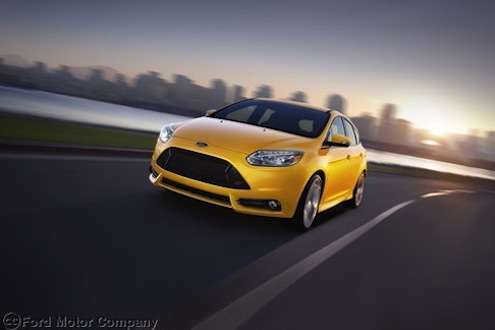 The new 2013 Focus ST is Ford’s new global hot hatch that is getting attention around the world. The new 2013 Ford Focus ST is a hot hatch that is getting attention around the globe. Top Gear magazine has crowned the Ford Focus ST estate Hot Hatch of the Year in its January edition just out yesterday. The new Focus ST is Ford’s first global performance car and is very popular in Europe and around the world. The sporty performance compact has been os sale in the UK since July, and almost 1,600 have sold which represents five per cent of overall registrations for the new Focus ST. The hot hatch is available in estate and five-door body styles and is the UK’s second best-selling car behind the new Ford Fiesta. Ford Focus ST outsells the Golf GTi by more than two to one. Top Gear took the performance oriented Ford Focus ST to Russia, where they put it through the paces on roads in and around Moscow. The Russian winter proved a good place to test the hot hatch’s combination of everyday practicality combined with scintillating performance in a variety of Russian winter conditions. The Focus ST is capable of 154 mph and will launch from 0-62 mph in 6.5 seconds. Ford’s first global performance car comes turbo-charged with a direct-injection 2.0-liter EcoBoost engine. The performance compact gets 39 mpg in Europe and deliveres CO2 emissions of 169g/km. The 2013 Focus ST delivers true performance with its high-output, 252-horsepower 2.0-liter EcoBoost engine which also helps ST achieve best-in-class manual fuel economy honors when compared with other high-performance small cars. It gets an EPA-estimated 23 city/32 hwy/26 combined mpg. It does require premium fuel to achieve the best performance. It features other performance features like high-performance brakes and a uniquely tuned sport suspension. Ford has completely re-engineered the ST to be true global performance car. The Top Gear testers found out just how fast the new Focus ST is. Whether in Europe or the U.S., the new 2013 Ford Focus ST is a global high-performance small hatch that will give any driver an adrenaline rush like few small compacts can. I drove it and found it to be more than just a hot hatchback, it can be civilized which speaks volume about this car. I could see myself driving it every day and then taking off into the canyons to get my fair share of adrenaline. It's an all-around good car.